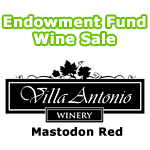 Villa Antonio, in conjunction with the Mastodon Fair, is selling Villa Antonio wine as Mastodon private label wine with the proceeds benefiting the Mastodon Fair Endowment Fund. You can help the Mastodon Fair while enjoying a bottle of your favorite wine. Each of the wines can be purchased by the bottle or case, and are available for immediate pick up at the Villa Antonio Winery. You can also call (636) 475-5008 for delivery. For directions to the winery and more information, please visit www.VillaAntonioWinery.com. If you are interested in ordering Mastodon private label Villa Antonio Wine, please print this order form, and order as directed. Thank you and Villa Antonio for supporting the Mastodon Fair so that we can continue encouraging the Art in science and the Science in art!